One click and it's clean! presents an affordable and ecological anti-lice comb with no use of pesticides. The Click'UP lice comb is the most effective way to eliminate lice. Combing has been used from time immemorial to remove lice and their eggs. Hair combing is the safest way to eradicate lice. 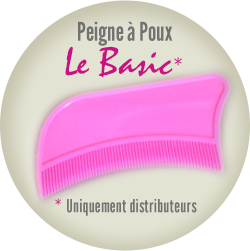 The Click'UP comb is non-toxic and non-allergenic. After a few days of use, you will notice a decrease in the number of lice. This process may require patience but great results are guaranteed. To order online, simply fill in the Click'UP order form and complete your transaction with PayPal, a highly secure online payment service. You'll receive your delivery within five working days. As a creator and manufacturer, we are always looking to link up with professionals, wholesalers or retailers to distribute the Click'UP lice comb or our Basic lice comb. Efficient: the flat teeth and its blades cut in bevel, are easy for a good styling. Hygienic: the material allows sterilization. Made in France en ABS recyclable. Ergonomics : rounded shape for the head and better handling. : Colors and marking comb : study at the request from 30 000 pieces. The louse is the common name for members of over 3,000 species of wingless insects of the order Phithiraptera; three of which are classified as human disease agents. While clinging to hair, we can see the presence of transparent moving lice before they have eaten. After having sucked the blood and juices of it's victim they become more apparent by turning grey in color. A louse lays about 8 nits (eggs) per day, or 250 nits during it's life. The nit is "the egg" of the louse. When alive, it is bright, brown and situated atleast 5 mm from the scalp. When the nit is more than 6 mm from the scalp, (which is caused by the growth of the hair) it is empty and whitish in color and glued, attached to the host's hair with specialized saliva; a saliva/hair bond. Three weeks after incubation, the nymph releases itself from it's "shell" and becomes a louse. The louse crawls and stings. The spread of the colony is made by direct contact of hair with hair or by the exchange of clothing. 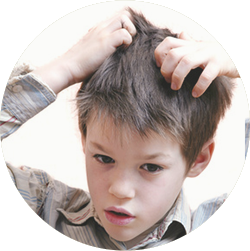 If your child has become infected with Lice, It is recommended to notify the school which he or she attends, and any close acquaintances to avoid further spreading. The invasion of lice isn’t due to a lack of hygiene, it has no social preference. There is no reason to feel ashamed.